주요 업종별 사업체수 및 종사자의 분포는 수도권의 산업기능 및 역할이 어떻게 다른지를 보여준다. 사업체수로는 전체적으로 서비스업이 우월하게 나타나고 있으나, 시계열적인 추세를 보면 2005년에는 1995년에 비해 감소하고 있는 것으로 나타나고 있다. 제조업의 사업체수는 2005년 들어 경기도가 서울시를 추월하고 있으며, 서비스업의 사업체수는 서울시가 경기도를 앞서고 있으나 2005년에 크게 감소하여 격차가 줄어들고 있다. 서울은 높은 지가로 인하여 일반제조업이 점차 감소하는 반면 서비스업이 증가하여 왔으나, 2005년에는 서비스업도 감소하고 있음을 알 수 있다. The distribution of establishments and employees of major industries shows the metropolitan area's industrial function and role. There are more service industries in the metropolitan area than other industries, but the number of service establishments dropped in 2005, compared with a decade earlier. Gyeonggi-do's manufacturing industries began to exceed that of Seoul Metropolitan Government in 2005. 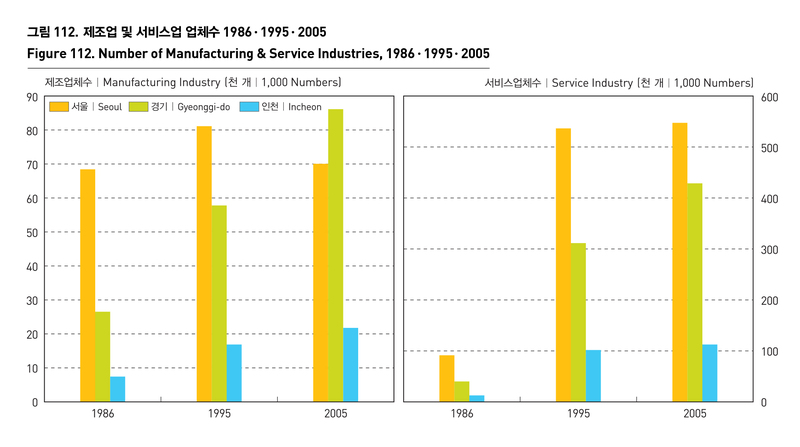 Seoul has more service industries than Gyeonggi-do has, but Seoul’s service Industries significantly declined, reducing the gap between Seoul and Gyeonggi-do. 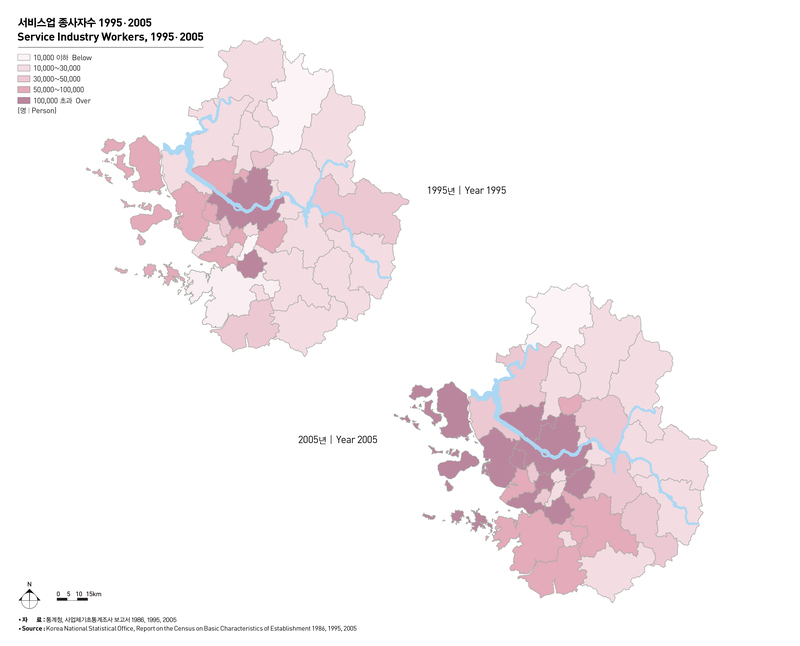 Seoul's high land value led to a decrease in the number of manufacturing industries and increase in service industries, but service industries also shrank in 2005.